Over the past couple of years especially, most of us have heard at least rumblings of the “blockchain”. Back in 2017, there was a huge surge of interest in the blockchain due to surging prices of cryptocurrency that was seen across the board, led by the extremely valuable bitcoin at the time. The term blockchain was seemingly synonymous with cryptocurrency. However, the underlying technology that makes cryptocurrency possible is quite useful for various other use cases. Many companies have realized the way the blockchain works is a great way to provide a secure way to establish trust. VMware and other companies have started to utilize the blockchain and its abilities to provide decentralized verification of trust for very interesting use cases. 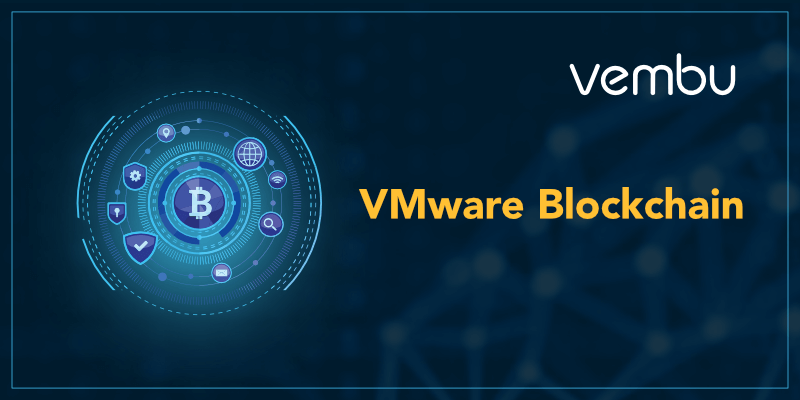 Let’s take a look at the blockchain and how technology is useful for this purpose as well as specifically how VMware is implementing its own blockchain offering. You may or may not have heard of blockchain technology. Blockchain technology provides exciting enhancements to current technology methodologies and takes security and in particular identity security to the next level. Blockchain technology was initially developed in conjunction with the currency revolution of the past few years. This is the underlying technology that makes digital currency such as Litecoin, Ethereum, and Bitcoin. Blockchain technology is based on the idea of a distributed database. This means that data is replicated between nodes in the blockchain in a peer-to-peer type communication. The information is reconciled between the nodes in the blockchain and if they reach consensus the information is validated. Unlike a central database in a single location that stores all the information, the blockchain stores information in a decentralized manner since the information is stored at all locations. This helps to ensure a high trust model of validating information replicated between nodes. This makes it exponentially more difficult to tamper with or maliciously delete/alter the information contained in the decentralized model. The blockchain is defined by data “blocks” which are the pieces of information that are replicated around to each node in the decentralize blockchain model. In terms of the general blockchain powering many cryptocurrencies on the market today, the blockchain itself resides on the Internet, so is inherently resilient. Since the blockchain is spread across multiple nodes and requires a large amount of processing power, the nature of the technology itself is highly secure in establishing trust in the data blocks themselves that are spread throughout the nodes of the blockchain itself. What is Blockchain and How Does it Affect Trust? Blockchain is all about trust. When thinking about blockchain vs a database such as a group of banks. They may trust one another to do business together, but they may not trust one another with the data. How do I know they are to be trusted with my data? 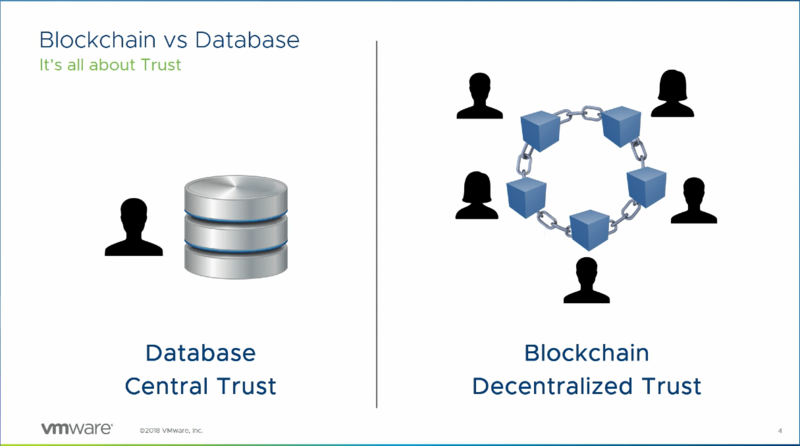 The database is about central trust, and blockchain is about decentralized trust. What Does Blockchain promise to do? The blockchain is not a problem/solution “fix all” solution. When thinking about use cases, this needs to be considered. Blockchain is solely about the trust of data and the decentralized trust model and reaching consensus about the trust of that data. In decentralized trust model, everyone has a copy of the data to be trusted and have to be in agreement that the data can be trusted. Blockchain technology provides many different great use cases for the underlying technology as shown above. Let’s take a closer look at the VMware specific implementation of the blockchain called VMware Concord and see how it implements and builds upon the constructs. The VMware blockchain is based on Project Concord which is an open-sourced, highly scalable and energy-efficient engine for digital consensus and contract execution. VMware has achieved the implementation of blockchain in an energy efficient manner, unlike the current blockchain technologies that cryptocurrency is built on top of due to low CPU and byzantine fault-tolerant core. Additionally, VMware has provided integration of their blockchain technology solution with the other VMware products and solutions such as NSX-t, Wavefront, vRealize Log Insight, RSA NetWitness, and others. Why is VMware getting into the space of Blockchain? VMware has stated they are focused on solving enterprise distributed management and security problems and have done so now for some 20 years. To get to a decentralized trust model, the nodes need to be placed in different cloud providers. 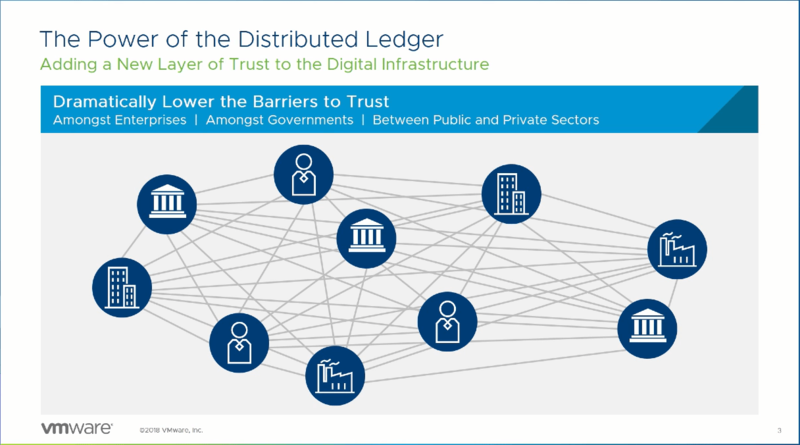 VMware’s strong relationships with enterprise cloud providers make the enterprise blockchain truly possible. VMware has invested over 4 years of advanced research and peer reviews followed by over a year of validation through customer engagements. We are certainly only seeing the infancy of blockchain implementations and use cases. The powerful decentralized model of blockchain technology allows businesses to develop solutions for establishing trust and providing end-to-end verification and tracking in various use cases. VMware has built a powerful blockchain solution on top of Project Concord, which is an open sourced solution, freely available for download and development. With VMware’s strong cloud partnerships and enterprise experience solving distributed and management problems, it certainly has a strong background from which to develop a powerful enterprise-ready blockchain solution. The VMware solution is currently in beta. You can find more information regarding the VMware blockchain solution by visiting https://www.vmware.com/blockchain and downloading the source code from the Github repository.